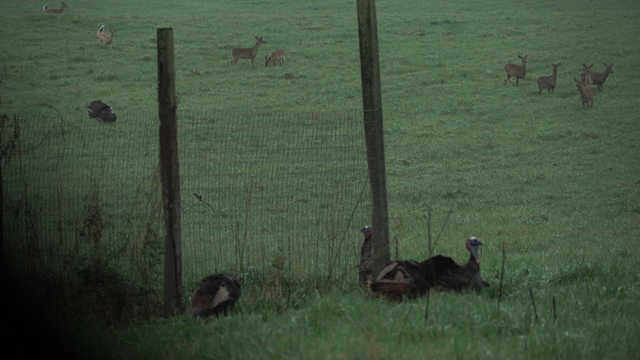 Saturday morning was the first day of the Pennsylvania Spring gobbler season. I was invited to go along with Guidefitters Tyler Hock to a 200 acre farm in south central PA. Tyler was wanting to get a long-beard killed with his bow, I was wanting to catch the action on video for a Guidefitter short film. Tyler and I were in the blind by 5:10. Neither one of us likes the idea of sitting in a blind but with the cold rainy weather , it was welcomed.The morning action started rather quickly when a neighboring hunter drove his 4-wheeler down the property line,just minutes prior to legal shooting time. Not long after, a gobbler sounded off to the south, closer to the truck than our position . That brought a smirk to both our faces, maybe we shoulda stayed at the truck! Daylight broke dark and gloomy. A few thunderous gobbles echoed out of the pines where Tyler had previously located some good sign. Tyler yelped a few times on his diaphragm and he was answered immediately. Game on! We were set up on a hayfield only 200 yards from the roosted thunder chickens. The wood line to our east jutted out to a point 80 yards in front of us. And like clock work, that's where the red heads appeared, bobbing in our direction. Camera rolling, bow in hand , released clipped on. Tyler whispers; " I'm going to wait till they're in the decoys." We didn't have to wait long. All four birds ran into the set gobbling the whole way. They put on a show for 10 minutes, 4 feet to 20 yards away. What a great way to get the season started! Any one of them could have been in the smoker by lunch time. But they were all jakes and Tyler was after a long beard. We both thought it, Tyler said it; " I want to run and gun". That's his style of turkey hunting and mine too. If it gobbles or bugles, we want mobility. That's what makes it fun for both of us. I said; you know if we leave, there's gonna be a strutter standing right before quitting time. " I know"; he said " but I don't want to do it that way". Off we went. Long story short we ended up back at the same field we started in, not on purpose but because we heard gobbling coming from that direction. Calling as we neared the field edge we could tell they were moving in our direction. 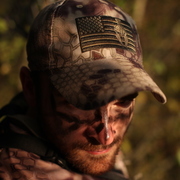 "Gotta get the strutter (decoy) set up in the corner where they can see it"; Tyler said.I agreed. Peeking out of the trees, we could see backs and tail feathers on top of the little hill just a hundred yards in front of us. While looking for a place to set up, we heard someone calling. Hearing this we just sat back and listened, we didn't want to ruin someone else's hunt . The birds starting moving in that directioRemember the guy who drove his 4-wheeler in just before daylight, making noise and shining his flashlight all over the place as he set up his decoys? Well, he didn't jump the gun. He stayed put. Yep, he got his bird. We didn't. We both knew our chances for success were a lot better if we just held tight. But that's not what we decided to do. Right or wrong, running and gunning is the method we prefer. Is there a right or wrong answer? Yes and no. Hunting without worrying about being "successful", then no. If having a bird hanging by his Spurs at 12 0'clock , then maybe yes. 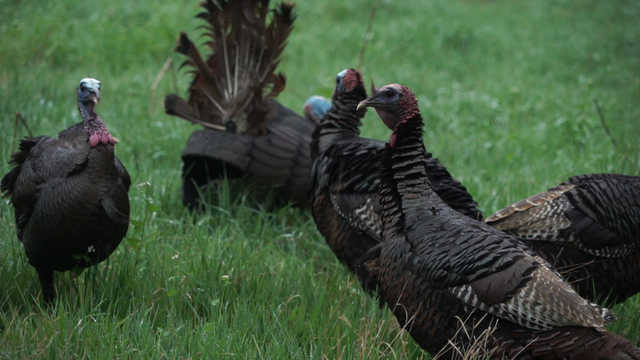 Hunting turkeys, especially back east where chunks of ground are often broken into smaller sections, sitting in a spot that you know to be a proven gobbler hangout is your better option. Turkeys, by nature, travel quite a bit but usually in a patternable way. If they miss you at daylight chances are pretty good they will be through before quittin time as long as someone or something else didn't spook them. A ground blind and a couple decoys set on a field edge or power line is a pretty good combination for fillin tags. You may get bored. Might not hear a sound for several hours. But once the hen he's been courting all morning goes to nest, he's gonna be out looking for more. In my experience , if he starts talking after 10:30, he's pretty kill able . And by staying stationary and ready, you don't risk spooking him while trying to get set up. It's not my way for hunting turkeys, but it sure is effective. Our Saturday morning neighbor proved that. Were we disappointed that we didn't get it done? Sure we were. We were also happy for the neighbors success . After all, good things come to those who wait! The lone jake coming in. About thirty seconds from when this pic was taken they started fighting. 20 some deer passed by us Saturday morning. They stayed in the decoys for a long while, gobbling the whole time. NIce story Lenny ! Sounds like a great day in the woods ! Sounds like you two had a exciting day!